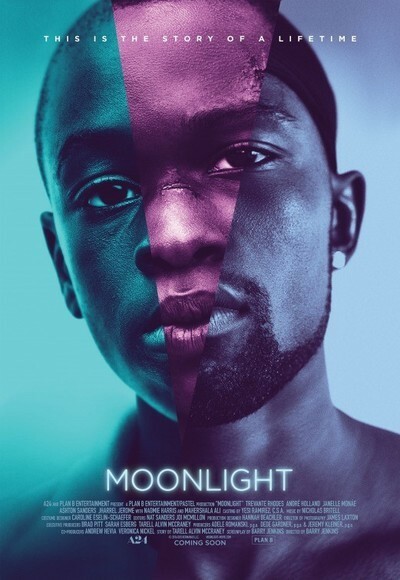 MOONLIGHT chronicles the life of a young black man from childhood to adulthood as he navigates the dangers of drugs and violence in a rough neighborhood of Miami. MOONLIGHT has won the Golden Globe for best picture (drama) and is nominated for eight Academy Awards. Bullied at school and beaten down by a harsh home life, Chiron risks becoming a statistic: another black man dominated and ultimately destroyed by the system. Despite his small stature and taciturn nature, Chiron is a survivor, and, as he grows, it becomes clear that his real battle isn't even on the streets. It's an internal one: reckoning with his complex love for his best friend.